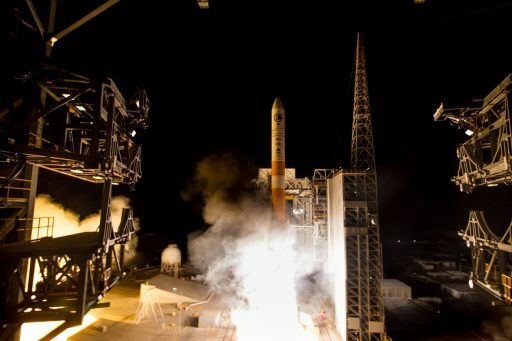 A United Launch Alliance Delta IV rocket lifted off from Vandenberg Air Force Base before daybreak on Wednesday, soaring into a backwards orbit with a classified radar imaging satellite for the U.S. National Reconnaissance Office. The fourth Topaz satellite blasted off at 11:40 UTC and the mission was declared a success after the NROL-45 spacecraft was released into its target orbit over 1,000 Kilometers in altitude. 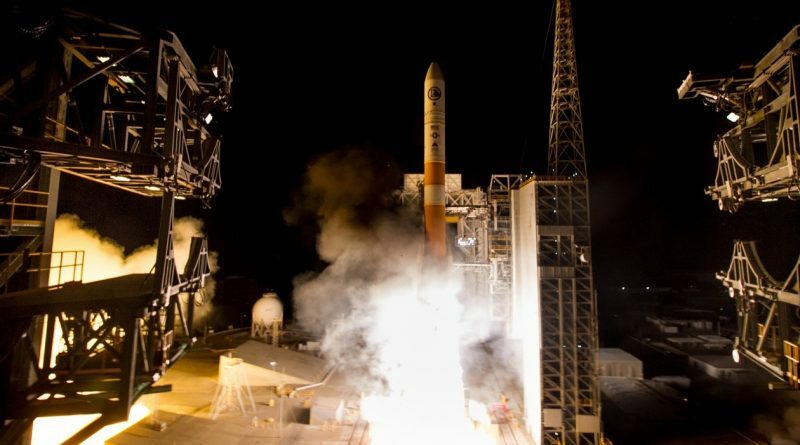 Wednesday’s launch, Delta IV’s first since last July’s successful deployment of the WGS-7 Wideband Global Satcom satellite, marked the rocket’s 31st mission and the sixth from Vandenberg. For ULA, this was the second mission in under one week, coming after last Friday’s GPS Block IIF12 launch. For the National Reconnaissance Office, designer and operator of all U.S. spy satellites, this was the first of four planned launches in 2016 to keep America’s eyes and ears in the sky sharpened. As a security agency, the NRO goes through great lengths to keep the identity of its payloads secret, however, oftentimes satellites can be identified by using clues such as the launch site, launch vehicle and ascent trajectory. 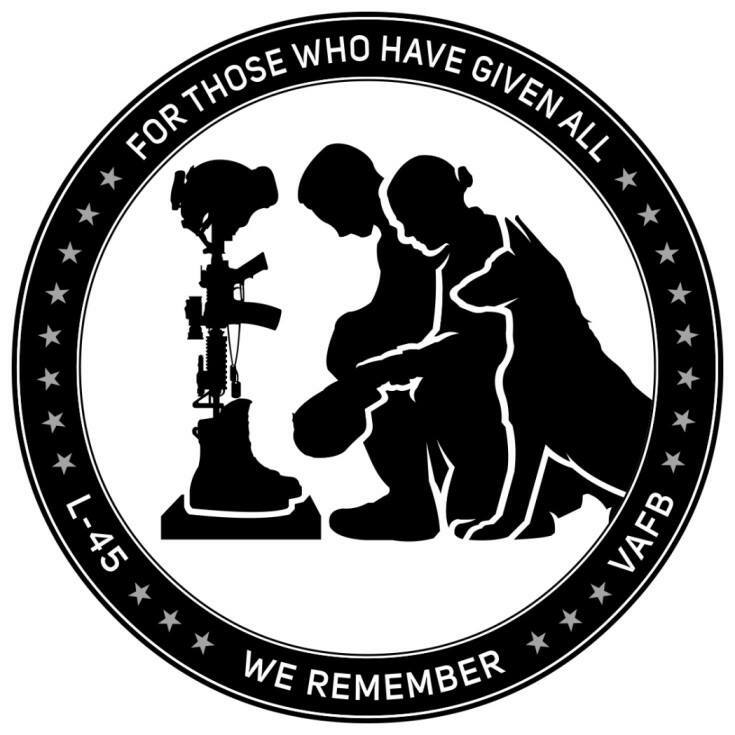 For the NROL-45 mission, the case is very clear – the specialized Delta IV M+(5,2) rocket heading into a retrograde orbit from Vandenberg leaves only one possible candidate: a Future Imaging Architecture (FIA) Radar Satellite also known under the codename Topaz. Built by Boeing, the radar imaging satellites can deliver sub-meter resolution imagery of the ground in all weather conditions, no matter if day or night. Radar satellites provide complementary data to optical imaging satellites deployed to orbit and can penetrate forests and even show underground structures, providing relevant data for policy-makers and the military. Topaz follows the Lacrosse and Onyx satellite programs launched between 1988 and 2005 by the Space Shuttle and the Titan IV heavy-lift rocket. Topaz was initiated as a project in 1999, but suffered a number of technical challenges leading to a multi-year schedule overrun resulting in the program’s first launch in 2010. NROL-45 follows the NROL-25, 39 and 41 satellites which all headed into unusual retrograde orbits. Budget documents leaked by whistleblower Edward Snowden shows that one more Topaz satellite is set to be launched in 2017 (NROL-47) before the program transitions to more advanced Block II satellites. Wednesday’s launch employed the Delta IV Medium+ (5,2) launch vehicle configuration making only its second flight after lifting the NROL-25 satellite in 2012. Standing 65.9 meters tall, the (5,2) version of the Delta IV features a Common Booster Core first stage powered by a single RS-68A main engine, a five-meter diameter Delta Cryogenic Second Stage fitted with an RL-10B-2 main engine, and a pair of GEM-60 Solid Rocket Motors tasked with lifting the 292,700-Kilogram rocket off the ground. To set up for an early morning launch from California’s Central Coast, the Delta IV rocket headed into a full evening of countdown operations, starting with the retraction of the Mobile Service Tower from the rocket around seven and a half hours prior to liftoff. Next was an extensive testing campaign taking the Delta IV rocket through powerup operations and a number of testing activities conducted by the ULA launch team to award the rocket a clean bill of health ahead of tanking. Heading into propellant loading four and a half hours prior to liftoff, Delta’s two stages received 229,200 Kilograms of -183°C Liquid Oxygen oxidizer and -253°C Liquid Hydrogen fuel. Tanking was by the book and the only issue standing in the way of an on-time liftoff were higher-than-expected ground winds. Luckily winds calmed down as the countdown progressed and the launch team completed the final preparatory steps for Delta’s ascent mission, checking out the vehicle’s RIFCA (Redundant Inertial Flight Control Assembly) one last time, serving as the rocket’s brains and controlling all aspects of the flight, in charge of navigation and launch vehicle commanding. Heading through the final four minutes of the countdown, Delta IV pressurized its tanks, transferred to internal power and a final GO was given from the Western Range. The powerful RS-68A main engine soared to life five seconds prior to T-0, setting the orange insulation foam around the first stage on fire as is often observed during Delta IV launches, particularly spectacular for those occurring at nighttime. 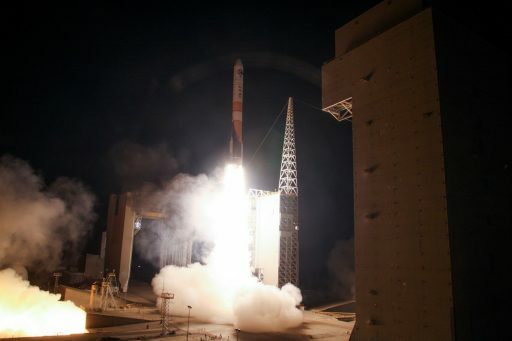 Upon ignition of the twin boosters, Delta IV jumped off its launch pad at precisely 11:40:32 UTC, 3:40 a.m. local time. 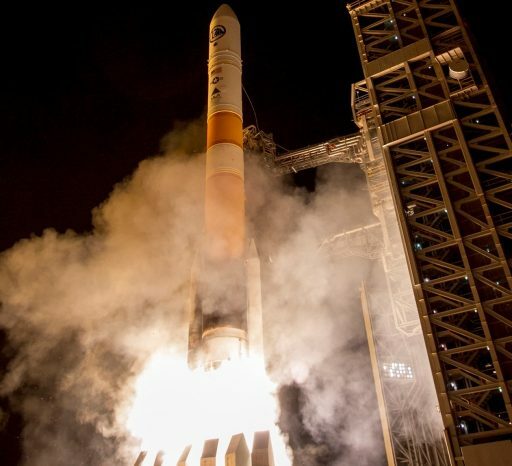 Powering uphill with a total thrust of 470 metric-ton-force, Delta IV swung to the south-west, having to fight its way into orbit and make up for the eastward rotation of the Earth normally taken advantage of when launching satellites into prograde orbits. Burning through 1,500 Kilograms of propellants per second, Delta IV pushed through the speed of sound 48 seconds after liftoff followed by Maximum Dynamic Pressure eight seconds later. The twin boosters, each consuming 30 metric tons of propellant, burned out one minute and 37 seconds into the mission with separation occurring three seconds later. Only powered by the RS-68A engine, Delta IV headed onward to an elliptical Parking Orbit with thrust increasing to 363 metric-ton-force in the rarefied upper atmosphere, guzzling down 840 Kilograms of supercold cryogenics per second. Three minutes and 12 seconds into the mission, the clamshell-type payload fairing split open and the two halves dropped away from the rocket that had departed the dense atmosphere by that point. As is customary for NRO missions, the flight headed into a pre-arranged News Blackout at that stage in the flight. Stage separation was completed right around the T+4 minute mark as the Common Booster Core departed the vehicle and the DCSS deployed the RL-10B nozzle extension before lighting the engine for an initial burn. Delivering 11,200 Kilogram-force of thrust, the RL-10B engine successfully pushed the stack into an elliptical Parking Orbit with a burn of over 12 minutes to get set for a coast of half an orbit to climb all the way up to apogee. The second burn of the second stage, likely only 15 seconds in duration, was tasked with circularizing the orbit. NROL-45, like its predecessors, was most likely aiming for an insertion orbit of 1,080 by 1,100 Kilometers, inclined 123 degrees. Spacecraft separation was completed around 90 minutes after launch and an official confirmation of launch success was provided by ULA one hour and 45 minutes after Delta’s early morning liftoff. The second stage was set for a third burn of its engine to drop itself out of orbit to head for a destructive re-entry for splashdown of any surviving components south of Australia around 140 minutes after liftoff. Wednesday’s mission marked the 373rd of a vehicle named Delta, dating back to the origins of the program in 1960. Delta IV, in its single-core versions, is looking forward to retirement in about three years time due to its high operational cost. ULA plans to cut its line of launchers with the inauguration of the Vulcan rocket that will take over from Atlas V and Delta IV, though the Delta IV Heavy version with three cores strapped together will remain in service to ensure the NRO’s heaviest satellites have continued access to space. The Keyhole electro-optical imaging satellites and Geostationary Signals Intelligence Craft require the raw power of the Delta IV Heavy to reach their target orbits. 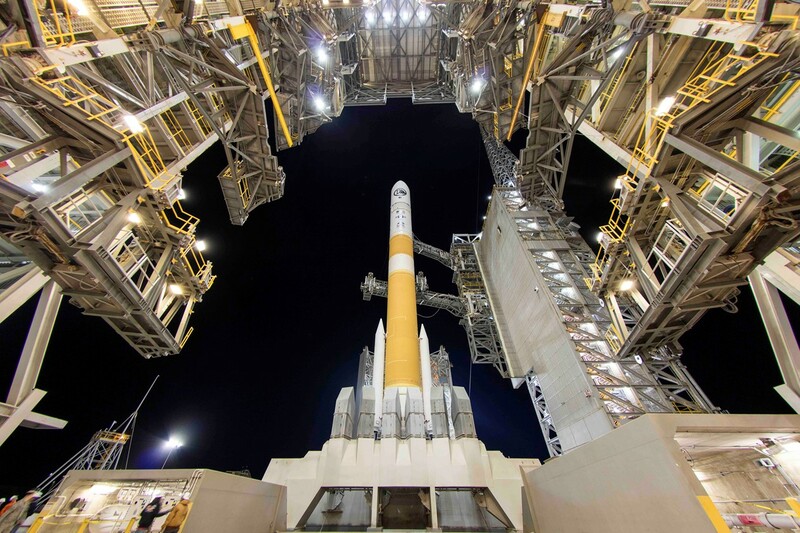 For Delta IV, the next launch is coming up in May when a Delta IV Heavy will lift the NROL-37 satellite. The next Vandenberg launch for the Delta IV will be the NROL-47 mission, the fifth and final Topaz Block I satellite in 2017. For United Launch Alliance, the next mission will be the launch of a Cygnus resupply craft atop an Atlas V rocket with liftoff currently set for March 20.